About once a month I take stock of my to-make list. This usually means a pretty big overhaul is about to happen. This last time I crossed a few things off that I was kind of iffy on from the start and moved a few things to the summer to-make list for next year (major sadness that summer tomatoes are long gone). And since I’m putting together ideas for how I can top my Thanksgiving appetizers and desserts from last year (I’m not sure that I can), I had no reservations about putting these homemade wheat thins to the test. At the very basic level, these are wheat crackers from a dough that you’ll roll out reeeeally thinly. And made with just 5 pantry ingredients, they are a pretty close match to what you’d buy boxed up. I get the convenience of boxed crackers but again it goes back to me thinking that if I can make it at home, then why not just do it? Why not cut out the ingredients I can’t pronounce and make something super fresh to enjoy? 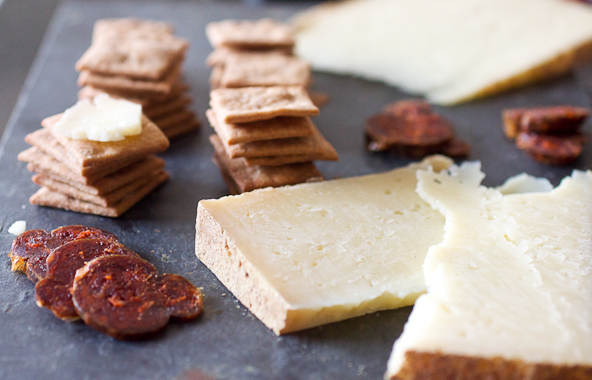 These crackers took maybe 40 minutes to make from start to finish – maybe – and with a little salt sprinkled on top and baked up crisp, we enjoyed some late afternoon cheese and crackers with my homemade wheat thins. How’s that for satisfying? I don’t want to give away what I’m thinking about bringing to my brother’s house for Thanksgiving but if my appetizer idea makes it there, these crackers will for sure be right there by its side. 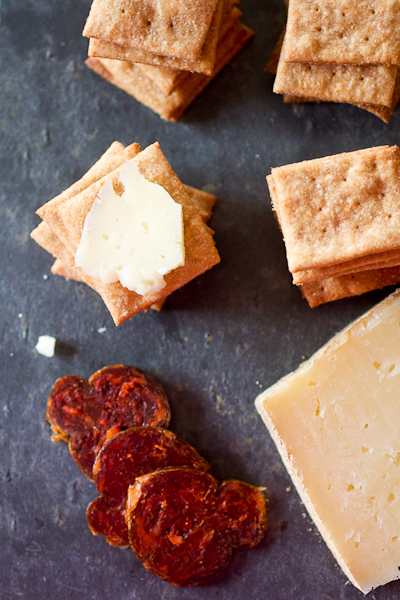 To maximize the crispness of these crackers, you’re going to want to roll them out really thinly. Like, to the point where you think you’ve gone too far and the dough almost looks paper thin – yes, that thin. If your work surface is well-floured, you won’t have any issues transferring the cut out dough to the baking sheet – just use a bench scraper or spatula to help with the transfer. The dough is pretty sturdy so you shouldn’t face issues with it tearing. Add all of the ingredients to the bowl of a food processor and pulse them until the butter is pretty evenly distributed throughout the mixture – it should remain fairly crumbly. Through the feeder hole with the processor running, slowly pour in 1/4 cup cold water. Let the processor run until the dough forms into a ball around the sides of the bowl. Transfer the dough to a well-floured work surface and divide it in half, keeping one half under a lightly damp towel while you work with the other half. Roll the dough into a very thin sheet – the thinner the better – and cut out 1 1/2-inch squares with a pastry cutter, pizza cutter, or sharp knife. I [obsessively] found that my long kitchen ruler was exactly 1 1/2 inches wide and this made my cutting all the easier. At this point, you’ll want to dot the squares with the pointy end of a meat thermometer to let the air and moisture escape while baking but there’s no need to go crazy with 9 dots per square like I did if you don’t want to. Repeat with the second half of the dough. Transfer the squares to the baking sheets, spacing them closely together (they won’t spread) and sprinkle each with a tiny bit of salt. Bake for 5-7 minutes (mine actually needed closer to 9 because I think my oven may be a little off), until the edges are slightly browned – they should look like a wheat thin at this point. Cool the pans on wire racks for 5 minutes then transfer the crackers to the racks to cool completely. The crackers will keep in an airtight container for at least a week and they can be reheated if they start to lose their crispness. Yields: at least 3 dozen – I got closer to 5 dozen. 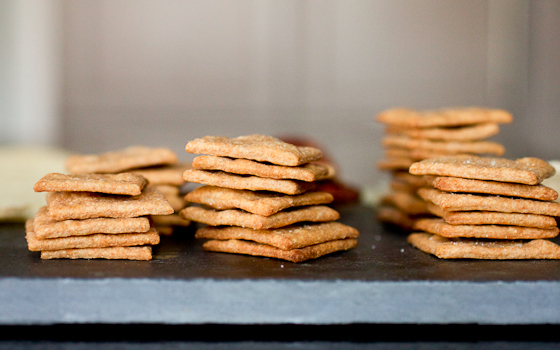 Love making homemade crackers, these wheat thins look perfect! I eat wheat thins literally all the time. I have SO got to try making my own!! These look fantastic! That’s totally my philosophy with crackers too. Made at home = ingredients you can pronounce! I like knowing what I put in my food. Also- Wheat thins are probably my favourite. Aside from goldfish. Although I would totally love to dress these up with some interesting flavours! Sundried tomato wheat thins? Yes please. Heck yes to sundried tomato wheat thins!! Ohhh, I love me some Wheat Thins! These look scrumptious! These cracker were great – thanks for the recipe! A couple of things I did to make my experience easier…I rolled the dough out ON the parchment then scored and docked it. Doing so eliminated the need to move all of those individual squares (I had about 50). Even though they bake together, you’ll be able to break them apart easily because the dough was scored. Also, to keep the crackers fresh, which wasn’t much of a task (they were eaten so quickly), I used desiccant packs like the ones found in vitamin bottles. You can reuse those OR order a pack of them from Amazon. These cracker were great – thanks for the recipe! A couple of things I did to make my experience easier…I rolled the dough out ON the parchment then scored and docked it. Doing so eliminated the need to move all of those individual squares (I had about 50). Even though they bake together, you’ll be able to break them apart easily because the dough was scored. Also, to keep the crackers fresh and crisp after baking, I used desiccant packs like the ones found in vitamin bottles. You can reuse those OR order a pack of them from Amazon. I saved the cheese packet from a box of macaroni and cheese…homemade wheat cheese crackers, anyone? OMG !!! These are fantastic !! Thank you thank you thank you. I baked mine 10 minutes and they were just right. For giggles I sprinkled one batch with a seasoning salt and another with garlic salt, and the last of the dough I left plain. You’re so welcome and thanks for coming back to say how they turned out for you! I LOVE the idea of seasoning the crackers too – great job! !